"Redfish" is a common name for a group of different fish, including drums, snappers, and roughies. Like the term "panfish," redfish is not exactly a scientific term but has become so widespread in its description for species of fish known for having a reddish tinge in color. Be sure to check out our Snappers section for more detailed information on the vermilion snapper and red snapper. This section will take a closer look at one of the most popular redfish for anglers, the red drum. General body color in young red drum is silvery; older fish become coppery brown or reddish. The species is characterized by one (sometimes more) large black spot near the base of the caudal finabove the lateral line. IGFA World Record catch of 94 pounds 2 oz (42.69 kg). Range from Massachusetts to Key West, Florida, along the Gulf Coast to Mexico. Fish (menhaden and anchovies), shrimp, and crabs. Red drum spawn in late summer and fall. During this period they migrate out of estuaries and lagoons and move into deeper water near the mouths of bays and inlets where they spawn. If you find yourself more than a bit confused when it comes to redfish, do not be alarmed. Many anglers use "redfish" when talking about red drum, when in actuality the term covers several different kinds of fish. Aside from red drum, other types of redfish include members of the snapper family and roughies (or slimeheads). Below we cover these three redfish variants so you can get better acquainted with the necessary fishing techniques unique to each species. After all, knowing what you want to catch in advance will help you pick the right fishing rigs for redfish and will be a major key to your success. The most popular redfish in terms of angling, at least in North America, is the red drum. These redfish swim along coastal waters in the Atlantic Ocean, ranging from the Massachusetts area and into the Gulf of Mexico. They can grow up to be 90 pounds, but more typically adults are less than 40 pounds. As with most fish, the best tasting samples come from those of a much smaller size as 15 pounds is the max you'll want to go to catch a meal. Their most distinguishable mark is the one or more black spots that appear on the tail. They can live to an impressive age of around 60 years old if they remain uncaught. 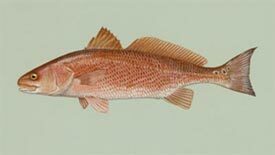 Red drum feed on crustaceans and mollusks found at the bottom, but mostly will come up to shallow, grassy areas to feed on smaller fish, such as mullet. Using the tide to your advantage is a popular redfish fishing technique, especially for red drums. As the tide comes in, so too do lots of small fish and crustaceans, making it a popular feeding time. When the tide goes out, they lie in wait for these potential meals to go back out into deeper water. Park yourself in the lane of whichever way the tide is going for best results. Shrimp and mullet are your best bet for live bait, but putting on a slab of cut bait can work just as well. Bounce the bait right off bottom, or at least dangle it a foot off if you're worried about getting hooked to the bottom. Red drum are typically caught through recreational style fishing as the many guidelines in place for commercial harvesting has made the fish a less popular choice for fishing industries. The result is an increase in red drum population in recent years that can only mean better fishing for generations to come. Red snappers make their home along the southeastern Atlantic coast of the United States and in the Gulf of Mexico, where salt water fishing is so popular. They are known in Spanish speaking countries as either pargo or huachinago, an important tip for those who may have a fishing guide with redfish experience who speaks little or broken English. Generally, this type of redfish swims at levels of 30 to 150 feet deep, but they have been known to be caught in water as deep as 300 feet. They prefer the bottom, especially if it is rocky, so be prepared to have an open-faced rod and reel that can get you to greater depths. Ledges and cliffs serve as the primary home for these redfish. The red snapper's body is similar to a lot of other species of snapper and that could make identifying them tricky. They have a sloped body when you're looking at their side, with fairly large scales and a spiny dorsal fin. Their short and razor sharp teeth look like a mouth full of needles, but redfish do not have the large canines on their upper jaw that are found in the other types of snappers in the sea. Still, they pack a nasty bite, so be wary when unhooking a snapper from your line. This particular snapper is more intensely red on its back, and that bright crimson color fades as it gets closer to the underbelly. They get the color from their natural diet, shrimp. Juvenile fish will often have a dark spot on its side, which will fade as it ages. The red snapper have been known to live for more than 50 years. These are very outgoing and social fish, traveling in schools with fish of similar size. 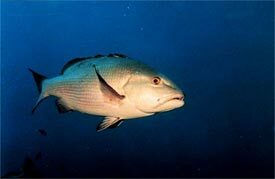 Given their tendency to swim together, as well as their notoriety as a good tasting fish, red snappers were once a very popular commercial fish. Strict quotas in the Gulf of Mexico have been set to offset the over fishing, thereby decreasing the fish's stock in the process. That leaves plenty of more fish for amateur anglers, however. Given the decreasing numbers of red snappers due to commercial fishing, the demand for the tasty fish far outweighs the supply. Artificial reefs have been created off the coast of Sarasota, Florida in an attempt to boost the population with hatchery-raised fish. The best way to catch a red snapper, as with most fish, is live bait. In this case, the best baits are cigar minnows, mullet, or sardines. Artificial lures work alright, but are not as successful. Often times chum is used to help attract schools of the redfish. Sizes for most angler-caught redfish range around 10 to 20 lbs and they can be a bit over a foot-and-a-half long, typically. Roughies, also known as slimeheads, get their name from their network of mucous-covered tunnels that course through the cranium as part of the lateral line, which is a sense that monitors movement and vibration. They live a long time and tend to inhabit the deep sea areas of the Atlantic, Pacific and Indian Oceans. There are 45 different species of this type of redfish, with most sharing the characteristic of long life. It is not uncommon for a roughie to exceed well over 100 years of age. Out of these species, the biggest are the orange roughie and Darwin's slimehead. Both of these species of redfish are caught, under strict guidelines, in commercial fishing operations around the countries of New Zealand and Austrian. It should be noted that Darwin's slimeheads are not eaten, but gathered for the oil they contain and then ground into fishmeal, but the orange roughies are sold fresh or frozen. These fish are easy to recognize due to their huge heads and eyes, along with their bright coloration. Once this type of redfish is caught and removed from the water it will fade from the bright orangish-red to a very pale orange. When fishing for orange roughies, try and release what you catch. The species was over fished to the point of near extinction back in the 1980's and have only recently made something of a comeback. Roughies in general are limited in numbers compared to other redfish and still need protection to this day. 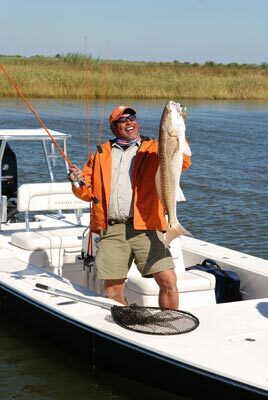 Redfish fishing guides will not only help you catch these fish but also fill you in on all the rules and regulations. Henry Waszczuk holds up a red drum. As noted earlier, fishing lures for redfish are not always the best choice. They are bottom feeders that travel in big schools so they will eat all sorts of live prey. Finger mullet, crab, shrimp and any small fish not quick enough to outrun them are going to end up on the redfish menu. Cut bait is going to help because it is easier for the redfish to detect and they will respond to it, using their sense of smell more than most species of fish. Most anglers for redfish use a four-inch mullet since they are the easiest to locate, but mantis shrimp can work as well, and can be purchased from pro shrimp trawlers. Fishing rigs for redfish can include a circle hook because that means the hook will not have to be set. In this case, pulling the rod back and winding that slack back in will work just fine. Fighting the birds to get the fish is important because terns, gulls and other sea birds are happy to steal an angler's catch if they can get to it first. Trolling is the most effective technique for all species of redfish. You'll typically need a rod of at least six-to-nine feet, using line ranging from 25-60 pound test depending on the redfish. A leader of about 40 pound test is recommended, and if you are using one you don't have to have such a heavy line. As redfish rely on scent more than anything else, having an attractive lure isn't necessary. Having smelly bait is, however, so if you are out of live or cut bait and need to switch to artificial lures, get a hold of some gear that'll add some scent. Redfish are notoriously quick fighters, meaning when they take bait, they run off with it at full tilt. To prevent a breakage in line - or worse, have the rod pulled right of your hand if you don't have a tight enough grip - be sure to lessen the drag while waiting for a bite. Tighten it up as you reel it in. A redfish's quick bite is a major reason to why they can be so fun to fish for.